In this section you will find all our products that have shapes and designs related to wild animals, such as zebras, lions, giraffes, monkeys and many more. We have several fun designs of buttons shaped as heads of wild animals that can be used for children's clothing due to its rounded shape (Bazooples). There are also many others by Dress-It-Up brand that can be very useful to decorate projects dedicated to the little ones. You can also find wooden buttons with shapes and patterns of wild animals, for use in didactic projects (such as silent books) and others in which children can recognize animal drawings. For use in refined projects that require a 3D touch, these ceramic buttons with shapes of African Savanna animals are very resistant and shiny. They can also be used in pieces that are going to be washed frequently, like cushions, because they are resistant to washing. 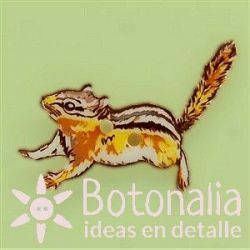 Beautiful designs of iron-on patches for children's clothes, such as zebras, monkeys, lions and wild animals. Designs with logos that make calls to wild nature, to stick on garments and sports bags that are used in outdoor sports and activities. The skin markings of zebras and tigers are very attractive to the eye and are widely used in designs of all kinds. In this section you will also find those buttons, brads and ribbons that have this type of designs, and that serve to complete projects related to Africa, wild animals and others. Stuffed animals with a spot to embroider a small design, embroidery kits with motif of wild animals, and more. Product Description: Decorative button with the shape of a long-tailed animal, such as gin or raccoon. Manufactured by DILL (Ref: 360422). To be used in scrapbooking, card making, crafts, patchwork and general sewing projects.Content: Price is per unit.Length: 28 mm.Material: Plastic. Decorative 2 holes buttons with the shape of a small monkeys. Perfect for crafts and projects of scrapbooking, cardmaking, patchwork, etc.Content: 8 pieces of 2 different models.Diameter: 19 mm approx.Material: Plastic. Decorative round buttons, with two holes, with irregular designs of animal skins, in both sides. Perfect for crafts and projects of scrapbooking, cardmaking, patchwork, etc. Content: 8 different buttons. Diameter: 20 mm approx. Material: Plastic (resin imitating mother-of-pearl). Product Description: Ribbon with a design of wild life scenes: hedgegog, raccoon and woodpecker, vertically up the tree. Width: approx. 15 mm.Content: The price shown is per 1 meter of ribbon.Composition: Synthetic textile and dyes. The manufacturer recommends not to iron directly over the ribbon.Designer: Mymaki, 2010 . All rights reserved. 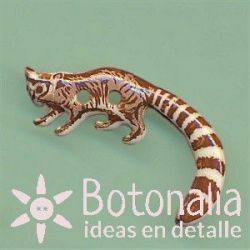 Product Description: Double sticker with an embroidery of a head and back of a zebra.Content: 2 iron-on stickers.Dimensions: 45x45 mm (head) and 50x60 mm (back)Material: Textile. Product Description: Double sticker with an embroidery of a head and back of a lion.Content: 2 iron-on stickers.Dimensions: 55x45 mm (head) and 45x58 mm (back)Material: Textile. Product Description: Iron-on sticker (patch) with an embroidery of a small hippopotamus.Content: 1 iron-on sticker.Dimensions: 30 x 45 mm. Max. length: 50 mm.Material: textile. Product Description: Iron-on sticker (patch) with an embroidery of a small elephant.Content: 1 iron-on sticker.Dimensions: 40 x 50 mm. Max. length: 55 mm.Material: textile.